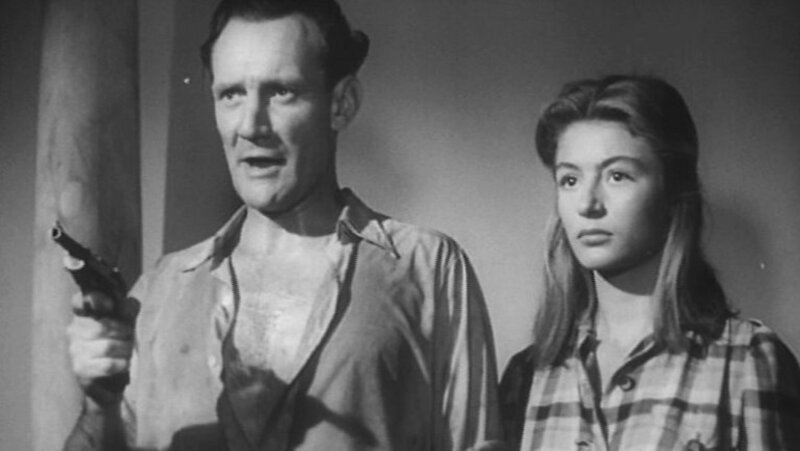 This adventure/crime film starts promisingly, with a man, later identified as a British archaeologist, driving through a torrential downpour in Tunisia, his road eventually blocked by a landslide and an abandoned truck. Investigating, he finds the truck’s cargo of boxes burst open, and firearms spilling out. He wisely avoids the two men who show up to salvage the wreck and walks to his destination, a small coastal city. There, he takes a room at an inn, run by a fetching young French girl, and frequented by an assortment of individuals, some clearly sinister, others merely secretive. The archaeologist’s purpose - the cataloguing for the British Museum of a collection of artifacts stranded in Tunisia by the recently ended war - is soon sidetracked by more immediate, and possibly deadly, concerns. I was encouraged by the opening. After all, a flood-producing rainstorm in northern Africa is a rarity in movies, which seem to think a desert is always dry. The finding of the pistols immediately signalled gun-running, and the stalwart British hero was obviously going to become involved. 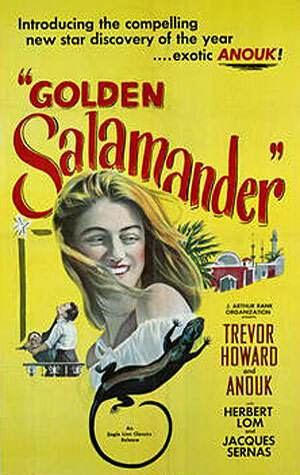 Unfortunately, The Golden Salamander very soon betrayed its invigorating beginning. I think the main problem here was the writing. The story comes from a novel by Victor Canning, who co-wrote the screenplay. Canning was an immensely prolific and popular author in the middle decades of the twentieth century; I gather he was a more cerebral Edgar Wallace. 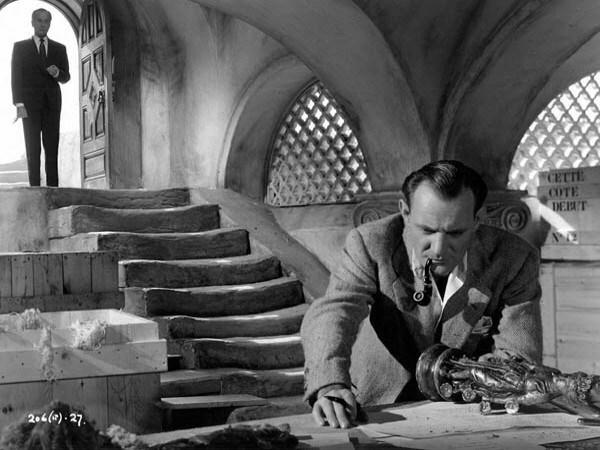 Whether his style was better suited to his time, this story was one of his lesser efforts, or it did not translate well to the screen, The Golden Salamander does not move along well. I enjoy a dialogue-heavy film as much as I do an action-filled flick, but the lines here are not particularly bright, incisive, smart or interesting. The characters too are rather bland. I found little chemistry between the two principal actors, Trevor Howard and Anouk (later called Anouk Aimée but, at eighteen, already a rising star of French cinema). Both are good actors, but Howard I did not find a persuasive romantic lead. 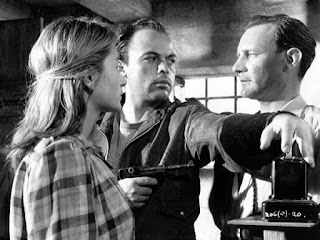 Wilfred Hyde-White, as a gentle toper, Herbert Lom as the obviously sinister villain, and Miles Malleson as the local police chief, are satisfactory. But again, the fact that none involved me in the film was probably the fault of the script. The direction was a bit pedestrian. This is rather more unexpected, as Neame was the man behind the camera in The Prime of Miss Jean Brody and Tunes of Glory. 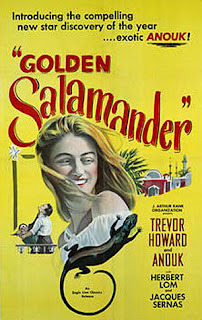 While he later directed action films such as The Poseidon Adventure, The Golden Salamander was only his second directorial work, and his first action movie, though the action is not very thrilling. The whole movie gives the impression of someone new to helming a project. For instance, a native wedding procession is featured, but it has no point to the plot, it doesn’t enrich the characters and their dialogue simply pauses while they look at the parade go by. It’s as if the crew was reminded that they were filming scenes on location, so they’d better make the most of it, whether it fit or not. So, while the elements were all present for an exciting crime-fighting yarn, they were not handled with any real skill. A more experienced, or confident, hand may have been needed. Perhaps a bit more of the Edgar Wallace touch. The name "Victor Canning" rang a bell with me, so I looked him up. Some time ago, I read a novel of his, a thriller called "The Rainbird Pattern." It was VERY dark--not the sort of thing you want to read right before bed--but interesting. 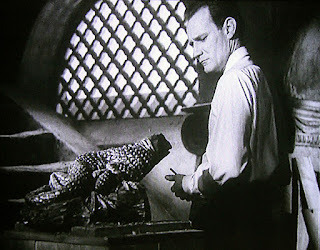 Hitchcock's "Family Plot" was based on the book, but for reasons best known to himself, ol' Alfred turned it into a comedy. I had no idea. It's one Hitchcock film I haven't seen yet. It's rather interesting for me to come across a connection, previously unknown to me, between an author, especially one with a great output, and a well-known film.